Zhou is planning five quads and two triple axels in the free skate at the 2018 U.S. Championships next week in San Jose, and says that he is practicing clean short and long programs, thanks to the adjustments in his training. He is coached by Tom Zakrajsek, Christy Krall and Drew Meekins in Colorado Springs, as well as by his longtime coach Tammy Gambill, who is based in Riverside, California. Part of the problem in France was an overly ambitious free skate with six quads. He fell on two of them and popped two others. Zhou also said he had been having some issues with his shin prior to France, which have since cleared up. He is also on the mend after his shoulder popped out of place on a fall on a quadruple salchow recently in training. He acknowledged that the pressures of an Olympic season, paired with his first full senior season, are challenging. The U.S. men’s field is stacked with Olympic contenders, including 2017 Grand Prix Final Champion and 2017 U.S. Champion Nathan Chen, 2016 U.S. Champion Adam Rippon, 2015 U.S. Champion Jason Brown, and 2013 U.S. Champion Max Aaron. “Everyone poised to make the Olympic team is a fighter,” Zhou said of his competitors, and he pointed to training mate Max Aaron’s work ethic this season as inspirational. Nationals will be a homecoming for Zhou, whose father still lives in the Bay Area while he and his mother live in Colorado for training. Editor’s Note: Figure Skaters Online’s Gina Capellazzi and Claire Cloutier, along with photographer Leah Adams, will be in San Jose for the U.S. Championships. 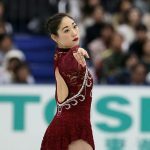 Follow Figure Skaters Online on Twitter (@fsonline), Facebook (www.facebook.com/fsonline), Instagram (https://www.instagram.com/figureskatersonline/) and on our website, www.figureskatersonline.com for coverage beginning January 2.